Author Jean Moule with her favorite fans. Author Jean Moule’s Kili and Me starts with a premise that takes the reader on a journey of true life stories intertwined with adventure. Moule, who has lived in the Stayton area since 1974, will share more about this work in progress at an author party, art reception and musical performance Dec. 5 at Papa Di Vino’s Wine Shop and Bar. An artist, writer and emerita faculty member at Oregon State University, Moule also will share more about her latest release, a second edition of Ask Nana Jean about Making a Difference, a collection of columns she wrote for the award-winning Skipping Stones magazine. 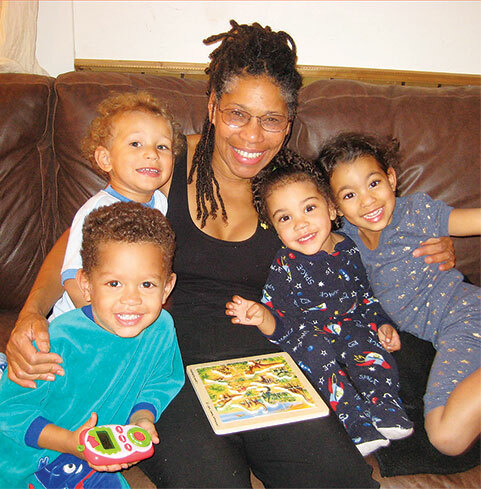 Moule’s book encourages family connections, understanding of racial issues, and contains full-color images of her landscapes. Moule will sign books against a backdrop of Portland-area vocalist Angela Rae Freeman singing jazz and pop classics to guitar accompaniment. Freeman’s daughter, Bella, is feature in Moule’s book. Moule finds it ironic that she writes so much now, having failed to qualify for the freshman English class at the University of California, Berkeley, in the 1960s. “I had to take ‘subject A’ before I could write well enough for that, though I was a whiz in math and science,” she admitted. Moule is often surprised by what she feels inspired to write about, she said. Beyond published research articles, Moule published a textbook, Cultural Competence: a Primer for Educators, used by many college and university courses. Her second edition of Ask Nana Jean also has many of her water colors, as well as five additional columns. Many of the columns in her books came from her travel journals or writing for her own use, she said. Moule will sign copies of her new, available for a suggested donation, at the Di Vino’s event, featuring herself and art work from artist Paul Toews, owner of Art Gone Wild Studio in Stayton. Toew’s acrylics, wood carvings, water colors and photography have been shown at Bush Barn and Elsinore Gallery in Salem, the Illustrated Gardens Gallery in Corvallis, and Soda Creek Gallery in Sisters. The event starts at 6 p.m. with music at 7 p.m. Papa Di Vino’s is at 1130 Royvonne Ave. SE, Salem.